Let’s take a closer look at some of the misconceptions about abdominal fat: how our body puts it on and how to get rid of it. This subject probably has a greater level of misunderstanding than practically any other health or fitness topic. The first misconception is that you can get rid of abdominal fat by working your abdominal muscles. This is based on some belief that fat is eliminated from a part of your body if you engage the muscles underneath that fat. It’s the same idea that you will lose fat on your legs if you pump your legs all day. The truth of the matter is that your body decides where to put fat and where to remove it, and it’s a system that is largely determined by your genetics. 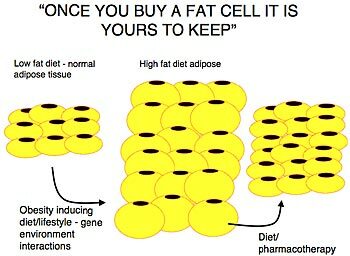 Your body wants to distribute fat based on a few clever strategies pioneered by your ancestors. First of all, your body stores fat in your midsection (your abdomen, hips or buttocks) due to basic biomechanics. The midsection of your body is the best place to store extra energy because it takes less energy to carry it around. Remember, fat storage is a survival strategy, so your body wants to maximize energy efficiency in the creation, storage and use of body fat. It wouldn’t make sense to have a lot of extra fat on your fingers and toes because you’d have to swing those around when you moved and that would require extra caloric expenditure. So given that your body wants to store fat as a way to have portable energy, it makes perfect sense that it would prefer to store that fat in your midsection. Secondly, from an anthropological point of view, the placement of body fat also has some implications for mate selection. This is especially true in women, where fat is stored in locations like the hips, buttocks and breasts to actually create a more attractive physical body in order to attract a potential mate. In this way, the fat is stored in predetermined locations on your body for much the same reason that a male peacock has brightly colored feathers — it’s part of the mating game, so to speak. Exaggeration of physical traits is a common evolutionary strategy for mate attraction in primates, including humans. And body fat can be used cosmetically to pursue this strategy. (Of course, it all happens automatically. You don’t have to “think” about where to put your body fat on any particular day, any more than you have to “think” about why you might sometimes feel attracted to another person. Thirdly, your body stores fat wherever you have fat cells. This may sound obvious, but it’s actually interesting when you realize that people who undergo liposuction to remove fat cells from their body end up causing a redistribution of fat to other locations that might be less desirable. For example, if a person follows an unhealthy lifestyle that results in the accumulation of excessive body fat, then they undergo liposuction to remove that body fat from their abdomen, but they continue to pursue the same overconsumption lifestyle that creates more body fat, then the body has to store that fat somewhere and since the fat cells have been removed from the abdomen, it’s going to put that fat somewhere else like the knees, or under the chin, or under the arms and so on. Your body has to work with the fat cells that exist, and if you start removing certain fat cells, you end up with fat being stored in places you might not have expected. Now let’s talk about losing abdominal fat. I see a lot of books and products that talk about reducing abdominal fat. They say “If you eat this way you’ll lose abdominal fat first.” Nonsense. There is no food, no exercise, and no herb that will cause your body to remove fat in one place versus another. If you want to reduce body fat, you need to start consuming fewer calories than you expend on a daily basis. In other words, have a calorie deficit. In time, your body will start converting fat into useable energy, and by doing so, fat stores will begin to vanish across your body. But they won’t just magically disappear from one particular place. If you are a male, abdominal fat is probably the last fat that will disappear from your body. First your body will remove fat from your face and extremities, such as your arms and legs, then it will remove fat from your upper torso, your chest, upper thighs and buttocks, and lastly it will use the fat stored in your abdomen. There is no way that I’m aware of to alter this fat reduction pattern used by the human body (except to use so-called “topical cutting gel” products which are highly toxic fat solvents that should never be used by people who want to protect their health). This means if you are really serious about reducing body fat and you want to get rid of that abdominal fat, you’re going to have to take a whole-body approach. You’re going to have to get used to the idea that abdominal fat is probably going to be the last fat to go. This isn’t what you wanted to hear, probably, but it’s the truth. For women, this means the last place you’re likely to lose the fat is on the hips and buttocks. This is something you may have already observed if you’ve ever tried to lose body fat, or if you’ve made some progress but couldn’t seem to get rid of that last bit of so called “stubborn” body fat. I agree, it can be extremely difficult to get rid of the last 5 kgs of extra fat, and especially so if you consume any of the popular foods. I’ve also found from experience that it’s virtually impossible to lose body fat if you don’t engage in routine physical exercise. And strength training is included in that exercise. By engaging in strength training, you will end up burning fat for hours and even days after your exercise session. There are also a lot of things you can do in terms of controlling your consumption of carbohydrates and altering natural hormone levels in the body to help reduce body fat. When it comes to abdominal fat, remember, there’s no way to eliminate that fat by itself without taking a holistic, whole-body approach. In other words, there are no fat loss shortcuts. And even if you try to take a shortcut by undergoing liposuction, for example, you’re still going to end up storing body fat somewhere else and it will probably look even worse than when it was on your abdomen or hips. So if you want to get rid of body fat, do it the right way: through diet and exercise, and not through cosmetic surgery or gimmicks that claim to eliminate fat from one specific area of your body. Fat loss takes real work, and even though there are some helpful appetite control tools available right now, there are no magic pills that will do the work for you. This isn’t what you’ll hear from those selling fat loss supplements and diet pills, of course. But it’s the truth as things stand today. Maybe we will see a revolutionary approach to fat loss at some point in the future but chances are that medical researchers will continue to be baffled by the human body’s multiple, redundant calorie accumulation mechanisms that have so far made it impossible to develop a safe, effective fat loss wonder drug. So go on …..diet…..exercise…..diet…..exercise……achieve your perfect bod. Love this post, you seem like a very intelligent and well rounded person. I also like how you get to the point in your writing. No magic way to lose fat. Lose weight by exercise and eating less. I don't understand why people get liposuction if they continue their habits?? Great post! I started recently again with exercising and I feel more energized by it, it certainly helps! I've been exercising for as long as I can remember. Though my tummy isn't perfect, I'm able to manage it from bulging out. Wow, this is so true. I've been excercising routinely now for almost two years, and weight training for about 5 months. Let me tell you, weight training has made a big diffrence on my body. Also I've been juicing for about 2 years every week, and this has also helped me think and live a healthier lifestyle. Happy you shared this article. Thanks Charu! This is an absolutely lovely post! You have explained a great deal about it…Thanks a ton for sharing these! Such an honest article dear…I really loved going through..I know some people who are planning to get liposuction done and I am sure going to share this for them. Diet plays an imprtant role, exercise without diet doesn't work both works hand in hand. Belly fat is the worst, but from my experience, it's the easiest place to see progress when you are eating cleaner and exercising! Awesome post! I agree, diet and exercise are key to losing fat. I write you here as well… Finally I follow all yours fanpages, tweeter, pinterest…. Totally true, less calories=weight loss, but, unfortunately, the fat may come off not in the way you like. You are not a big advocate of liposuction, but I think for people with some lumps and bumps in the wrong places, lipo may be the only solution. Yes, true, fat has to accumulate somewhere, but fat may end up being more evenly distributed around the body as opposed to sitting in one lump on the lower part of your tummy or the love handles or wherever that problem area is. Lots of people have had great success with lipo, so I would not discourage girls to have a little fix if it helps them psychologically. Absolutely lazy in this winter ???? very interesting article (: i didn't know about the order in which the fat is stored. You're so right – you need to exercise constantly… and some good green tea helps too. Lovely post, is not easy to loose weigh but with hard work ti does work. Giveaway on my blog, link below. This post was so informative! I did not know a lot of these things. Exercise is key. You've got to move it! Oh belly fat, the bane of my existence! I have to eat right and exercise or I end up looking like I have a baby bump. And it gets harder the older you get. But you are right on with this advice!! !